Nice place with a great location. It was extremely difficult to meet people though as there was no real common room, just a breakfast room. 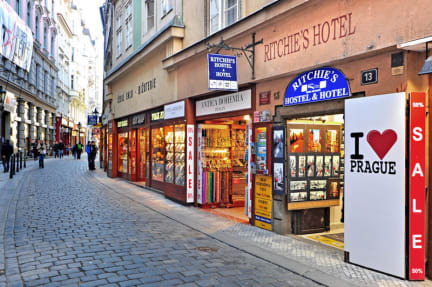 Great hostel in Praha center close to club, restaurant and people. Good place for guys Who want go to party no for tourist Who wants rest in calm because the night is noisy. Really good place and Really Good personnal. Enjoy you trip ! Un frenchi à Prague. lemplacement de lhotel est au top, au coeur de la vieille ville et à une centaine de metre du charles bridge. La chambre est tres sommaire mais on peut noter la salle de bains dans la chambre. Le point negatif est le fait qu il n y avait pas assez de casiers dans la chambre ( 6 casiers pour 8 lits). Jai surtout fait connaissance avec des gens dans la chambre et non dans les espaces communs La fille à laccueil etait tres sympa et repondait à mes questions sur la ville. The location was really exceptionel, you are close to almost everything you can visit. But otherwise the dormitory were awful, not only the 10 beds are really close to one another, but more, the room was really dirty, there is only one shower and one toilet for everyone (and really dirty all the time), the beds were really uncomfortable, but the main problem is that THERE IS NO ROOF ! Like, there is a roof in fact but it is made of a king of glass so we were all awake at 6am.